Newport Exhibition Group has announced that its 46th Annual Newport International Boat Show will take place September 15 – 18, 2016 at the Newport Yachting Center in downtown Newport, Rhode Island. One of the largest in-water boat shows in the country and the premier show in New England, the Newport International Boat Show encompasses over 13 acres and will host hundreds of exhibitors from around the world with new powerboats and sailboats from 16 to 100 feet, plus a variety of accessories, equipment, electronics, gear and services for boaters.To accommodate the growing number of exhibitors this year, Newport Exhibition Group is adding more docks to the North and South side of the marina. 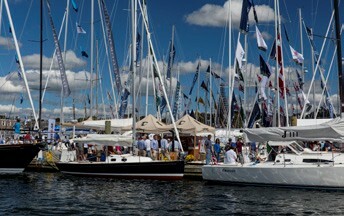 In addition to the boats, products and services, there will be a number of events to educate and entertain visitors. At The Helm, presented by Confident Captain in conjunction with US Sailing/US Powerboating, returns with an expanded lineup of on-the-water training courses for beginners and seasoned boaters. These courses are ideal for individuals or families who are interested in learning how to sail or operate a powerboat, or for those who simply need a refresher course. The 2016 series will also include a kid’s on-the-water program and women-only courses. The highly anticipated Newport For New Products (NFNP) program provides attendees with the exciting opportunity to view boats and products making their first ever debut in the U.S. Each NFNP entry is judged by a panel of experts and awards are given for best new powerboat; sailboat; navigation product; and boating operation, maintenance or safety product, at a ceremony on Friday, September 16. Adding to the visitor experience, and running concurrently with the Newport International Boat Show, the inaugural Newport Wooden Boat Show will take place at Bowen’s Ferry Landing Marina, and the annual Newport Brokerage Boat Show will take place at Newport Shipyard. All events are within walking distance or can be accessed by water taxi shuttle. Sunday, September 18. Advance tickets are now on sale. For more information, visit newportboatshow.com.